One of my boys’ favorite cereal is Reese’s Puffs. 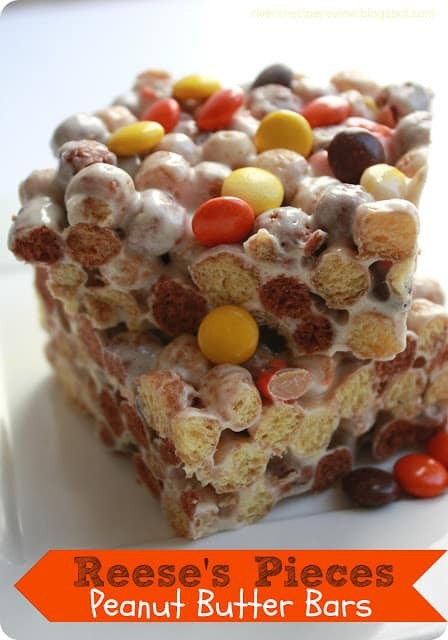 So when you add marshmallow and Reece’s pieces, it is definitely going to be a hit. I love how easy these are to make and they are a nice change to Rice Crispy Treats. We all loved them! Things that I changed: I kept it the same. Things that I would do differently next time:I might try adding a Tbs of peanut butter to the marshmallow mixture. Yum! Lightly spray a 9×13 pan and set aside. In a large bowl, count out the cereal then set aside. In a large pot, melt the butter over medium heat, then add the mini marshmallows. Stir constantly, until marshmallows are completely melted, to prevent scorching. Immediately pour over cereal and stir until completely covered. Add 2/3 of the Reese’s Pieces to the mixture… the pieces will become all melty gooey. Spread into the 9×13 pan. If necessary, spray hands or spatula with cooking spray to prevent sticking as you press the mixture into the pan. Pour the rest of the Pieces onto the top of the mixture, and lightly press so that they adhere to the still sticky marshmallows. I made these a few days ago, and am already getting requests to make them again. People are even offering to buy the ingredients for me just to make them! Thanks for the awesome recipe! How much marshmallows should I use of the jumbo size?? These were easy… and so delicious. I made them to bring to work, and a coworker has a dairy allergy, so I eliminated the butter and melted the marshmallows with agave nectar. It worked! Also, I added the peanut butter (like you suggested) and it is amazing. Thanks for this!